Details emerging from the Asylum Down Headquarters of the New Patriotic Party has it that, twice defeated flagbearer of the New Patriotic Party Nana Akufo-Addo sanctioned an ’emergency crises meeting” on Monday night, to devise means of diffusing the grand exposè on his vulnerable victims of Akufo-Addo’s terror and violently cruel torture against members of his party who did not support him or his choice , which was shown on Metro TV’s Good Evening Ghana program, on Monday. Viewers of Paul Adom Okyere’s Good Evening Ghana program were left in a state of an intense feeling of great fear, shock and disgust for such a sorrowful and horror scene. Many were those who kept asking the question, “what shall it profit Akufo-Addo for visiting such heinous attack on fellow members of his party? What then happens to Ghanaians who did not vote for Akufo-Addo, in the unlikely event, Akufo-Addo becomes President?” In the horror scene shown on Monday, one victim of the intolerant and Militant Akufo-Addo’s terror attacks, Atluk Ibrahim, whose crime was because he supported and campaigned for NPP National Chairman Paul Afoko revealed how Akufo-Addo busied himself with the plotting of evil against party members who did not support Akufo-Addo and how Akufo-Addo plotted the killing of Adams Mahama in acid bath. In fact, the bone in the right arm of Atluk was damaged beyond repair. Nana Kwame, another victim of Akufo-Addo’s physically violent attack, was tortured with metallic objects as he now face a near total paralysis yet, his crime for been attacked by Akufo-Addo’s thugs was because he supported Alan Kyerematen. Incredibly sad, another woman named as Araba revealed how Akufo-Addo’s private thugs molested her, stripped her naked and beat the hell out of her, just because she exercised her inalienable right to choice , by supporting Professor Frimpong Boateng, among other victims. Due to this monumental exposè over how Akufo-Addo had visited his intolerant and terrorist attacks on innocent souls of his party, the crises meeting at Akufo-Addo’s home was said to have “considered” the concoction of a smear campaign against the President or whoever the Kyebi family of Akufo-Addo did not like in other to diffuse this nightmarish revelation against Akufo-Addo’s dangerous and intemperate nature. Checks done by our source reveals that, a fiercest cousin of the NPP flagbearer Gabby Otchere Darko suggested in the meeting that, he will arrange for media, sympathetic to Akufo-Addo such as Citi fm, Multimedia group, Despite group and others to trump the propaganda they were going to adopt. In fact, Akufo-Addo family settled on the use of a northerner(s) to do the smear campaign against President Mahama or any northerner they did not like, and we can confirm that, this was the basis upon which Mustapha Hamid was considered. Also, considered was the deceptive creation of comic scene such as the masking of party persons as fetish priest to wildly engage in some outrageous stage managed activities, with the intent of shifting the “psyche of their usual suspects” from the real issues. It is not surprising that, the chips surrounding Mustapha Hamid’s uninspiring lies are falling at a fast pace. So far, Prudential Bank, in a memo, a copy of which is available to us, has denied ever having a bank account with the name Bugri Naabu, in their database . This is in contrary to the claims by Mustapha Hamid on Tuesday. 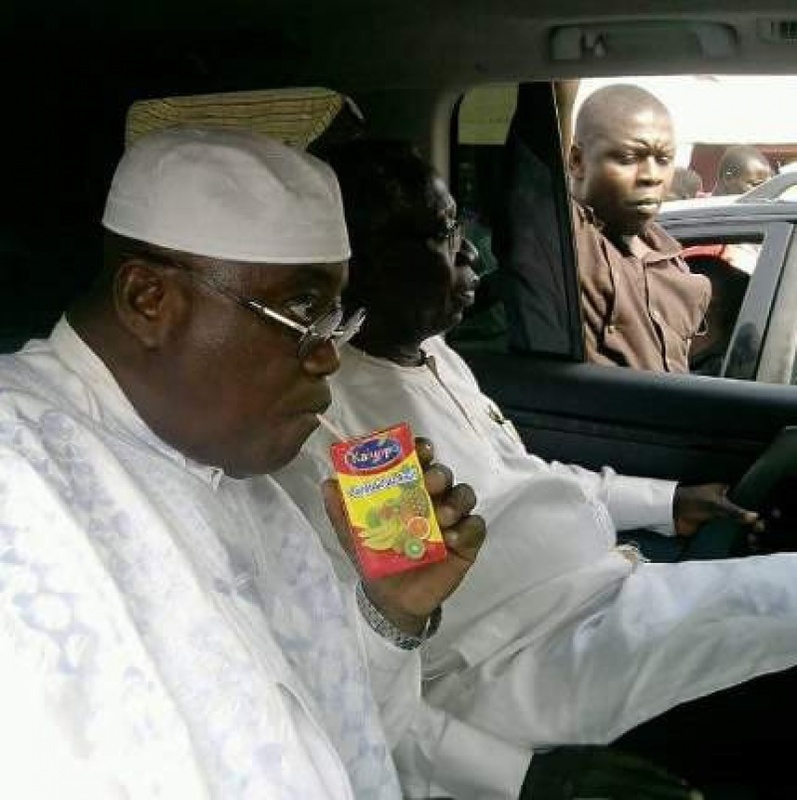 Official: Akufo-Addo's Chief Bans President Kufour's Vehicle From Parking in Kyebi Palace?